Let’s say you’re strolling through a glade 15,000 years ago. A wolf comes out of the forest. “Oh, that’s a big one,” you think. More wolves come out. You slowly realize—they’re all big ones. Those are dire wolves. Get ready to run. The dire wolf was first described by Joseph Leidy, a physician and scientist who had an admirable flair for the dramatic. He started his career with much less dramatic animals. In the 1840s, he used fine tools and microscopes to dissect and examine mollusks. His talents for physiological description and microscopy diverged and flourished. He made contributions to science as varied as proving that North America had an ancient species of horse which died out before modern horses were introduced, and gently suggesting that, if a pork chop had larva inside it, it was probably a good idea to cook it more thoroughly. By 1854 he was sufficiently eminent to be sent fossils, including the odd canine fossil from a young man called Frances Lincke. Leidy analyzed the fossil, determined that it was definitely not from a species of canine currently scampering around the Americas, and called it Canis dirus. How Would a Dire Wolf Have Brought You Down? Dire wolves are sometimes listed as the largest canid species ever to have existed, but they weren’t what we think of as megafauna. The largest of them were around 175 pounds, and they were only about 30 pounds heavier, on average, than the wolves currently alive today. In terms of height, they weren’t as tall as modern wolves. The weight they had went into a heavy build. They were broad-chested, not long-legged. When scientists study fossils of dire wolves, they’re looking at a long history spread over a large area. The species emerged 300,000 years ago in North America, and spread over multiple continents. It even had variations on form—the Eastern dire wolves were a bit bigger than Western dire wolves. Despite the expanse of time, it is possible to make a few conclusions. Physiologically, dire wolves were not a varied bunch, even between the sexes. Slightly larger teeth on the males are the only real sexual variation that anyone’s found. They hunted in packs, bringing down horses and bison. Good hunts might have brought down a giant ground sloth. During lean times they would have turned to scavenging carcasses—many dire wolves have worn or broken teeth from chewing bones—and eaten what smaller animals they could catch. That’s not really different from modern wolves. There is one difference that might make you look at a dire wolf with more dread than a regular wolf. A lot of studies have been done comparing the various strengths of modern wolf teeth, hyena teeth, dire wolf teeth, and saber-toothed-cat teeth. Dire wolves didn’t have the toughest teeth in the business, and they weren’t accustomed to crunching down on bone. They had something else. Isn’t that a pleasant thought. A strange thing happens in dire wolf fossils found between 15,000 and 12,000 years ago. Dire wolves get healthier, especially in terms of dental equipment. Their teeth are less worn, and fewer teeth are broken. This indicated that the wolves were scavenging less on bony carcasses and eating more succulent prey. After hundreds of thousands of years of taking whatever larger predators had left behind, or fighting them for their own kills, dire wolves are feeding themselves exclusively on meat and leaving aside tougher stuff. Things seem to be looking up. It was a false dawn. 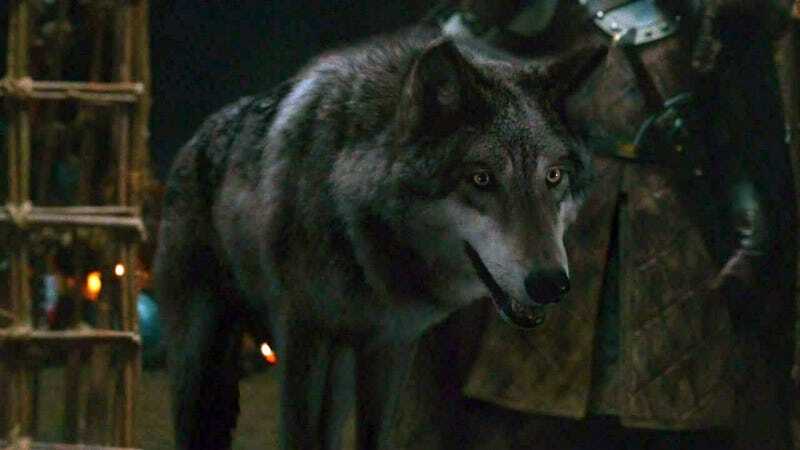 In another two thousand years, the dire wolf would be extinct. The dire wolves were eating more because the huge predators were dying off, leaving them with no competition for the huge, slow-moving megafauna. Soon the megafauna were also dying. After the big ground animals disappeared, the smaller, more fleet-footed animals were all that were left. They were being hunted by what we think of as modern wolves—which shared the world with dire wolves for tens of thousands of years. The stocky bodies of the dire wolves just weren’t able to survive, while the smaller, thinner, faster modern wolves did. So today, we live in a world with the animals that outran the dire wolves.